Traditionally, this pie is based on the flavors of pears belle Hélène, a French dessert made with poached pears, chocolate sauce and ice cream. To make this dessert more accessible, Hallmark's Pear Pie recipe relies on more common pears, such as Anjou and Bartlett. 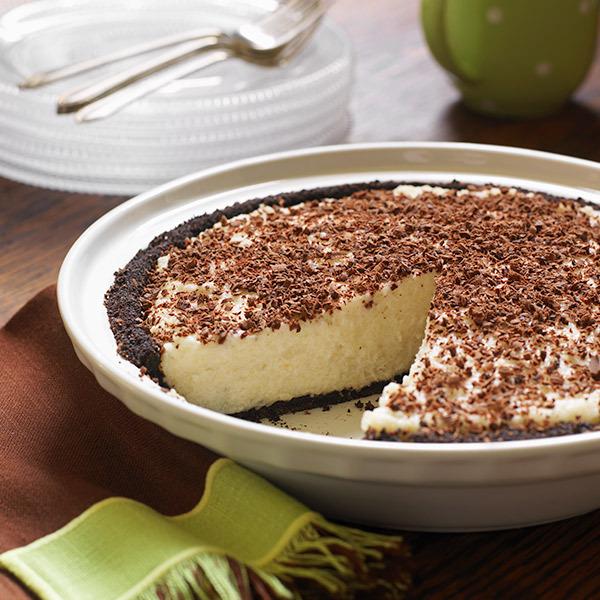 The grated semisweet chocolate topping goes well with the chocolate wafer cookie crust. Make the crust: Preheat the oven to 375°F. In a food processor, combine the chocolate-wafer cookies, sugar, cinnamon and salt. Pulse to form very fine crumbs. Drizzle in the melted butter and pulse just to combine. Press the crumb mixture into a 9- or 10-inch pie plate. Bake for 10 minutes to set the crust. Set aside to cool. Make the filling: In a medium saucepan, combine the pears, sugar, pear vodka (if using) and salt. Bring to a simmer over medium heat and cook, stirring occasionally, until the pears are very tender, 10 to 15 minutes (depending on how ripe they are). Reserving the cooking liquid, drain the pears and transfer them to a food processor. In a small heatproof bowl, sprinkle the gelatin over the cold water to soften. Add the reserved hot cooking liquid to the gelatin and stir to dissolve. Add the gelatin mixture to the pears and puree until very smooth. Add the vanilla and almond extracts, and blend. Transfer the puree to a bowl and let cool to room temperature, then refrigerate until the mixture will mound on a spoon, 2 to 3 hours. In a bowl, with an electric mixer, beat the heavy cream until stiff peaks form. Fold the whipped cream gently but thoroughly into the pear puree. Spoon the mixture into the pie shell and refrigerate for 8 hours or overnight, until firm. Just before serving, grate chocolate over the top of the pie.